Enrolling in school, getting confirmed, and getting married—these are just a few of the many instances of your life when you need a baptism certificate. Hence, as early as today, you need to have your documents ready in case you need to present it for specific purposes. Not sure how to create one? 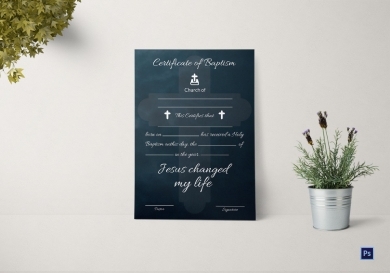 Worry not for we provide you the best baptism certificate templates and examples that are easily customizable to fit your preferences. We believe that creating a baptism certificate need not be stressful. 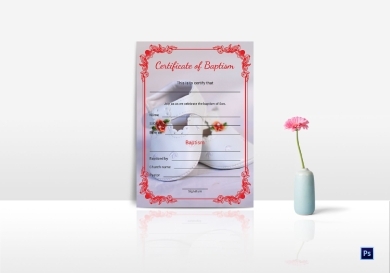 Hence, in order to help you easily achieve the design that you want for a baptism certificate, we provide you this clean and awesome certificate that you can edit using computer programs that can open Photoshop and MS Word Pages. You can edit the template and personalize the information that you want to include in your legal document. You are also free to move the elements around until you get satisfied with the arrangement of the elements and designs in your certificate. 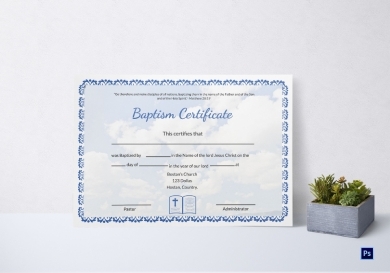 It is the primary responsibility of the parents to create a baptism certificate for their child, but because certificate creation can sometimes be time-consuming, we will provide you with this template that is easy to edit in just a few clicks. You are free to edit the text and supply your own pertinent information. 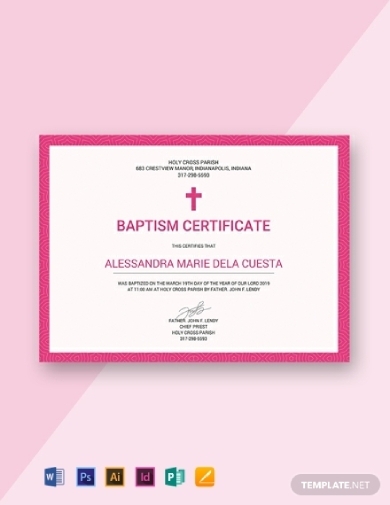 Typically, the details that must be present in a baptism certificate are as follows: the information of the church or parish including its logo; the title of the document; the name of the baptized child; the date, time, and place baptized; and the name, signature, and contact details of the church or pastor baptizing the child. 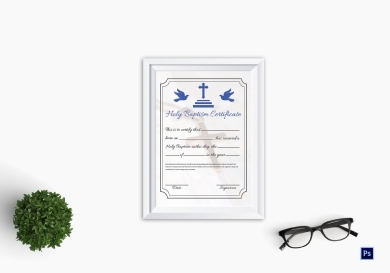 Why settle for a dull and boring baptism certificate when you can have this editable and modern certificate? Carefully designed by professional designers, this certificate is guaranteed with high-quality graphics, making it appear elegant and polished. The great thing about this document is that because it is customized digitally, you can save a soft copy of the certificate for future purposes aside from printing a hard copy. Although most of the baptism ceremonies will take place when the person to be baptized is still a baby or an infant, adults too can still be baptized. There is really no age requirement for the baptism of a person. In fact, believer’s baptism, occasionally called credobaptism, often baptize an adult who is old enough to earnestly profess their faith. In this case, an adult baptism certificate displayed above can be used. It is very convenient to use, and your preferred design and style is just right at your fingertips. 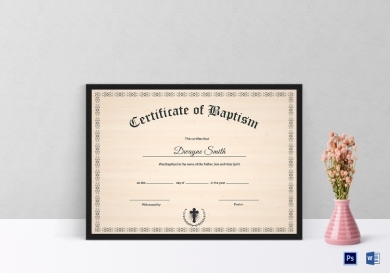 If you are a busy bee and only have a few minutes of your time to spare in creating a baptism certificate, this baptismal certificate is what you perfectly need. Because of its easy-to-edit feature, you do not need to spend more hours in designing your certificate. All you need to do is open the document on compatible software applications that can edit MS Word and Photoshop file formats. Busy for the preparations of your child’s baptism? We got your back. Although there are a lot of documents and preparations that you need to arrange, we will help you when it comes to baptism creation. It will only take a few clicks in a few minutes to achieve your preferred style. With this template, you can save a lot of time in creating a certificate as compared to when you are starting from scratch. You will also enjoy the benefit of high-quality graphics and designs, making your document look neat and professional. 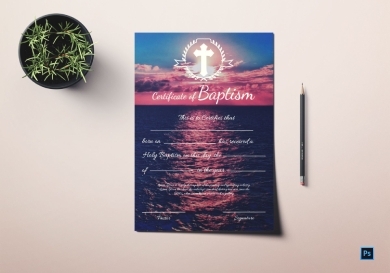 What’s stopping you from getting this premium-quality baptism certificate? By subscribing, you will get access not just to this template but to the entire website as well. You may also opt to purchase a single template, and after that, you can easily customize the template to tailor fit your preferred style, format, and design. You can even personalize it as your own, save on your local computer, and print a hard copy for legal and documentation purposes. This template is designed with intricate red patterns on its border with a background color complementing the text. This superb template comes in different file formats, namely MS Word and Photoshop, thus making it convenient for the users to edit the template and customize it as their own. 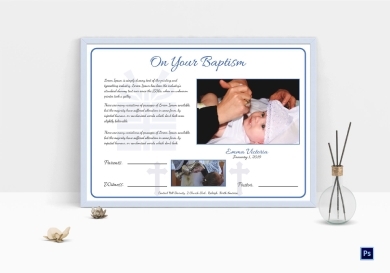 Do not waste your time and start creating your baptism certificate now with the use of this print-ready family suite baptismal certificate. Most of the time, parents are busy in their respective works that they only have less time to spend in creating a baptism certificate for their child. However, given that a baptism certificate is important as it is a document required in some cases—for example, as a document in preparing to get married—creating one must be among the top priorities of the parents. 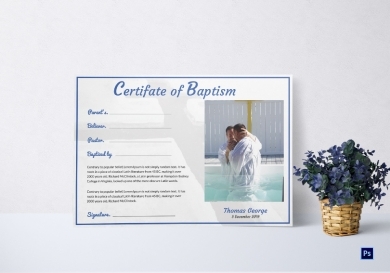 In order to help parents get their tasks done with less hassle, we provide you with this easily customizable baptism certificate template, which is available in many file formats, such as Illustrator, Pages, InDesign, Photoshop, MS Word, and Publisher. 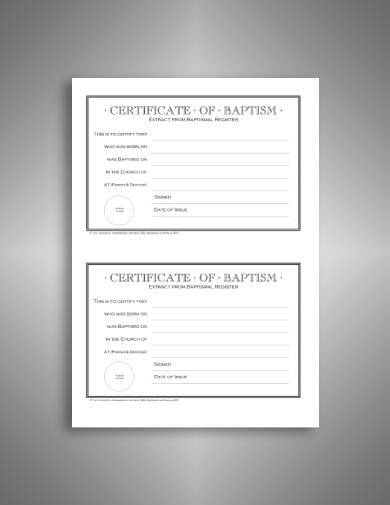 In this certificate of baptism example, there are blank spaces where you can write the name of the person baptized, the date of birth, the place of baptism, the name of church or parish, the date of issue, and the signature of the pastor or priest baptizing. It contains a simple border that is neatly placed along the edge balancing the plain text on the face of the word document. So what are you waiting for? Choose your most preferred template now and download it so you can immediately start editing and customizing your baptism certificate.